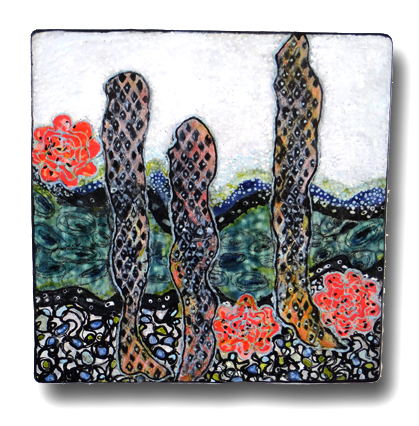 "Rotifers" Earthenware and glaze ceramic collage with 3-d elements. 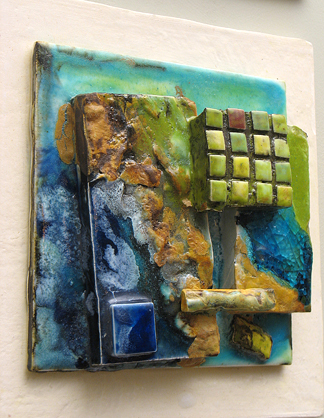 "Water Pipe", Glaze drawing on earthenware clay, mounted on wood, with wire hanger for wall mounting. 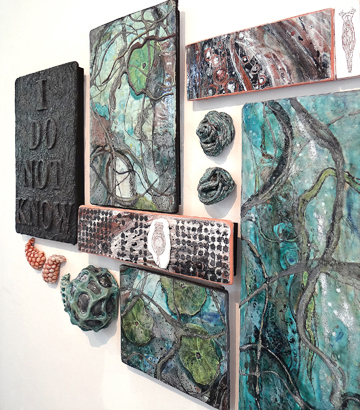 26" x 13" x 2"
"Stream of Consciousness" Earthenware and Glaze drawing on earthenware clay, mounted on wood with wire hanger. 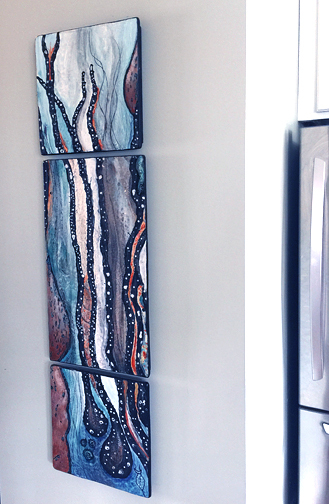 22" x 22" x 2"
"Dance", Glaze drawing on earthenware clay, mounted on wood with wire hanger. 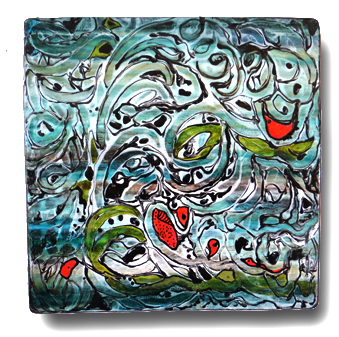 12" x 12" x 2"
"In the Depths" Glaze drawing on earthenware clay, triptych, mounted on wood with wire hanger. 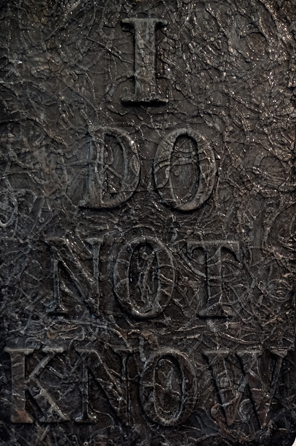 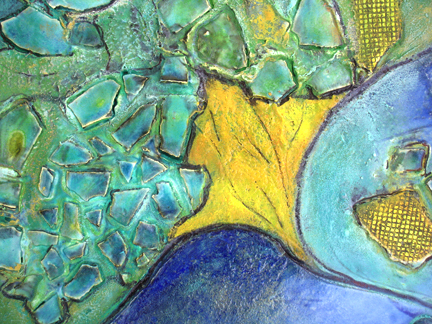 50" x 13" x 3"
Detail: " In the Depths"
"The Nature of Hands", The New St.Mary's Hospital in Jefferson City. 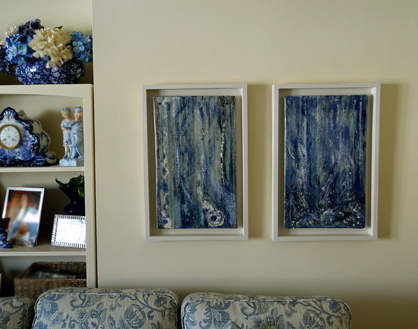 Ceramic tile and wood framed collages. 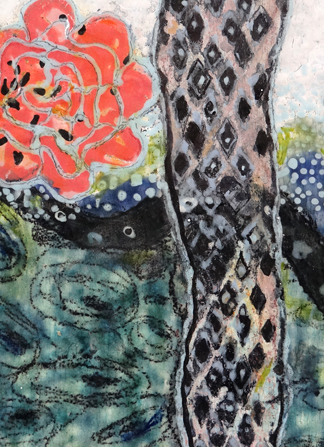 2014.The title of this work, the Nature of Hands is inspired by two meanings of the word nature. 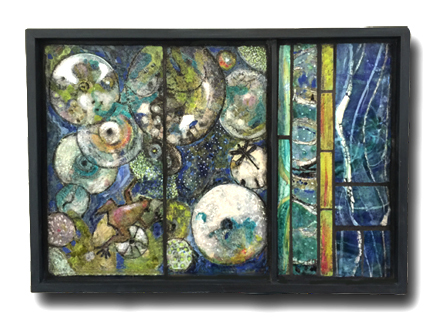 The first definition of nature-- the phenomena of the physical world collectively, including plants, animals, the landscape- is presented here as an expanse of nature inspired by the Central Missouri country side. 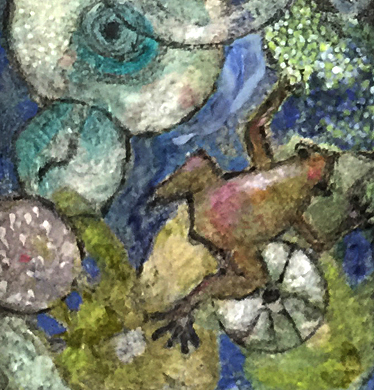 The flora and fauna in the artwork are symbolic and abstract. 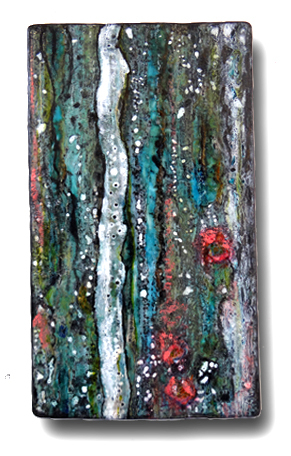 They represent biological life forms from both the micro-scale and the human-scale worlds. 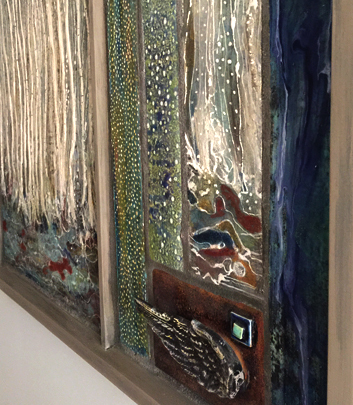 In this piece, you can discover small healthy cells, abundant seeds, new leaves, vines, flying fauna, and multiple water symbols which are just a few of the many other natural elements contained within the artwork. 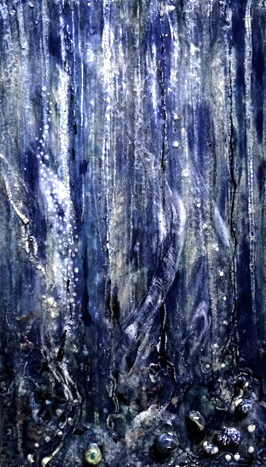 The second definition of nature is 'the essence of a thing’. 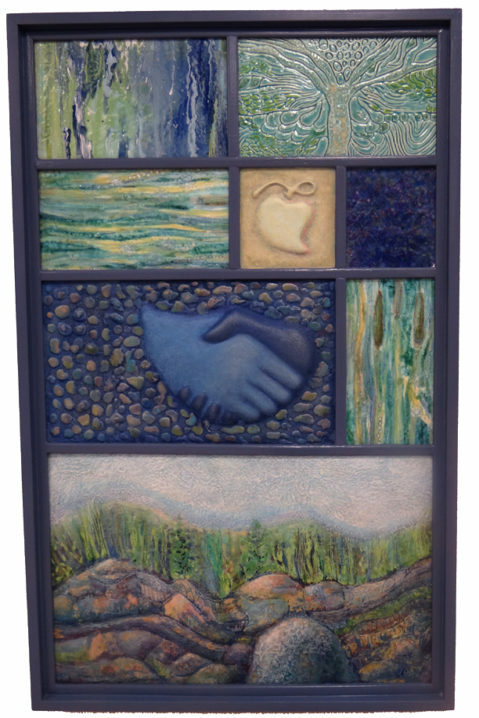 This definition of nature is represented by the pair of hands within each panel. 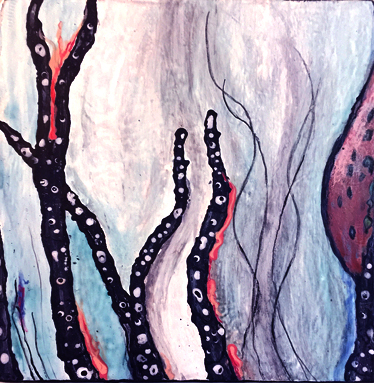 The hands are stylized, and not meant to be any certain individual's hands. 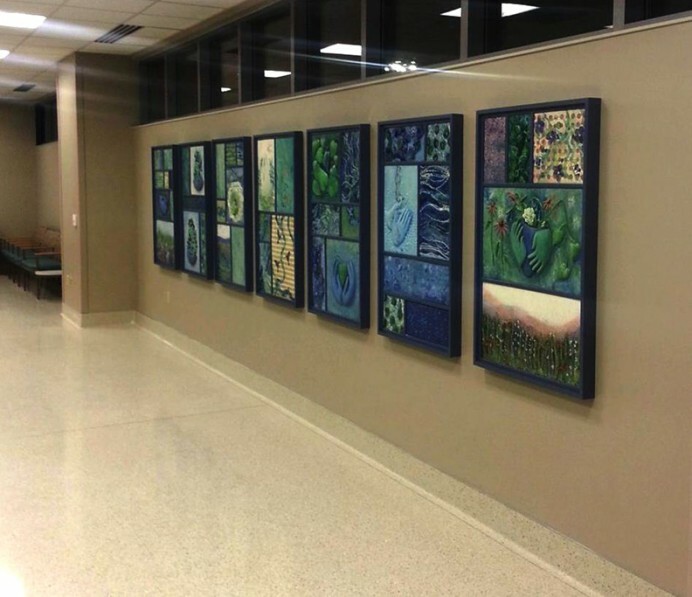 They are inclusive symbols of all the hospital employees hands--gloved and working together to create a healing environment. 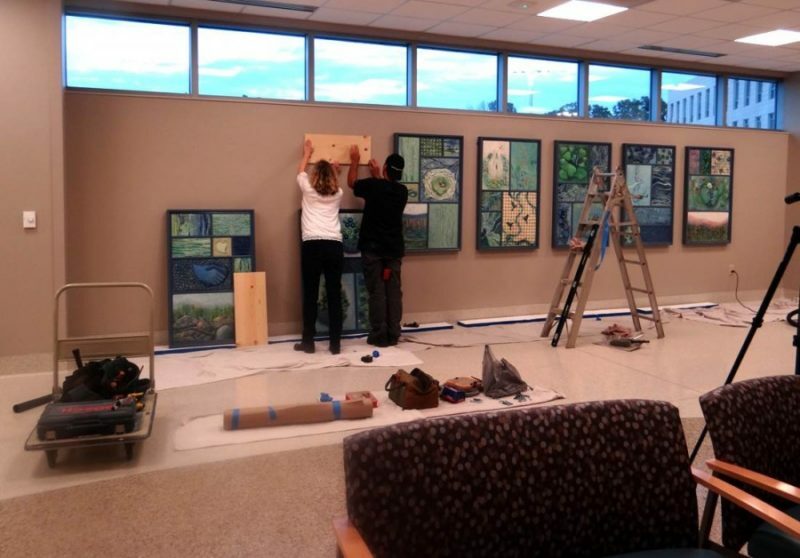 The hands are joining, offering, caring, praying, protecting, cleansing, and giving-- critical life giving activities that are performed hundreds of times each day in this hospital. 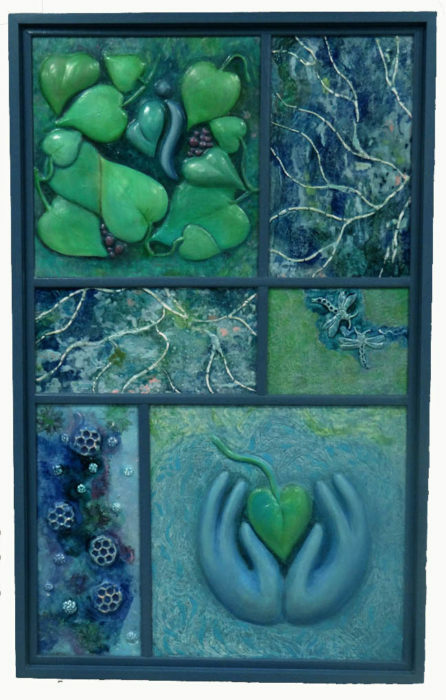 "Affirming" 1st panel of the "Nature of Hands"
"Caring", 5th panel of the "Nature of Hands"
"Bio-Indicator" glaze drawing on earthenware clay,wood framed, with wire for hanging. 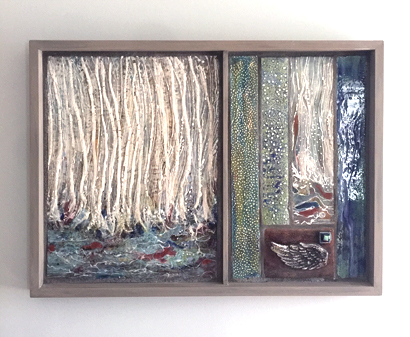 31" x 21" x 2"
"Fly", Wood framed ceramic collage with 3-d elements. 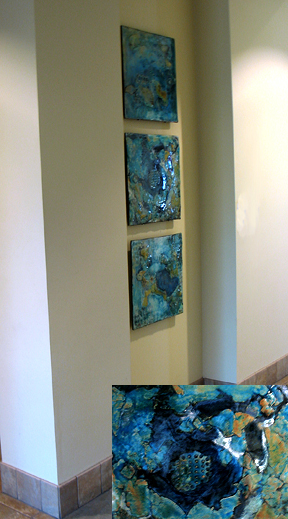 29"x 21" x 2"
Installation view of a commission with inset detail of "Material Terrain Glaze and raised relief elements on porcelain substrate, mounted on wood with wire hangers and security feature for a public space. 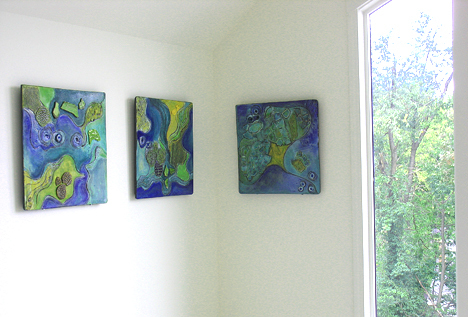 Each piece is approx 23" x 23" x 2"